Members of the public were asked to agree or disagree with the statement: I always wash my hands immediately after handling raw meat, poultry or fish;: Via PixabayFor our new research project, we wanted to know whether chefs in a range of restaurants and eateries, from fast food venues and local cafes to famous city bistros and award-winning restaurants, were undertaking “unsafe” food practices. As some of these – such as returning to the kitchen within 48 hours of a bout of diarrhoea or vomiting – contravene Food Standard Agency guidelines, it was unlikely that all respondents would answer as honestly if asked about them. Stock image via PixabayWhat we found from all of the responses was that it a can be quite challenging for consumers to find an eatery where such unsafe practices are absent. 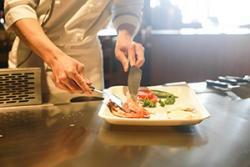 Chefs working in award-winning kitchens were more likely (almost one in three) to have returned to work within 48 hours of suffering from diarrhoea and vomiting. A serious cause for concern as returning to work in a kitchen too soon after illness is a proven way to spread infection and disease.